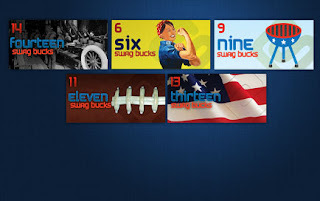 The folks over at Swagbucks have put a fun twist on their reward points - Collector's Bills! From now through September 6th you have a chance to win one of five Collector's Bills celebrating Labor Day. Each of the five is for a different amount and each one has a different image - you can keep track of your bills by looking in the "My Swag Bucks" area of your account, and if you get all five during the promotion, you'll get a 10 Swag Buck bonus instantly applied to your account, meaning you'll be even closer to getting the free stuff you love! You can only win these bills through search, and once you have all 5, you’ll snag yourself that sweet 10 Swag Buck bonus. You can keep track in the My Account Area, and you have until 11:59pm PDT on Monday, September 5th to get all 5 – share your wins on Facebook and Twitter so we all know how close you are, and good luck everyone! How exactly do we earn these 'collection'-items, via searching? Does it just happen randomly, when we use the SwagBucks search engine? What type of notification should we look for? Does it just pop up? Is there anything we can do, to affect the odds of getting a "bill" to come up? Thanks for providing all this advice and information, on your excellent blog!